You may be surprised that I take such an interest in the arts of the 19th century; traditionally, I should probably concentrate my research work on ‘Higher Levels’ or ‘Earlier Periods’ of Belgian silver, thus being more in line with the interests of the ‘High Society’ of important Belgian collectors. Maker’s mark: A letter B in the middle of a compass and a square. In the 1990’s the value of Belgian 18th century silverware raised considerably. This phenomenon did not surprise the ‘initiated’ connoisseurs. The value of Belgian silver had stayed quite under-priced due to lack of knowledge and research work. But now with a series of specialized Belgian silver sales by major international auction houses, more research and public support, prices appreciated considerably. The scarcity of high quality Belgian silver objects of the 17th and 18th century had one immediate consequence – the marketplace became a ‘battle field’. Belgian collectors saw it as their patriotic duty to buy these national treasures. But many others found these prices prohibitive and started to look for new collecting fields, which resulted in a surge of interest for 19th century Belgian silver. We must stop looking at 19th century European silverware through the deforming magnifying glass of prejudices; we must free ourselves from judging it by 18th century standards; and we must stop lamenting the application of new and modern techniques as inferior. Rather than dismissing whole style periods, we must recognize that one can find quality and trash in every style. There are Empire period creations, documenting crafts-manship, skill, refinement and originality being on a par with the best output of 18th century, on the other hand one can find quite light, low quality items made in Paris at the end of the 18th century or under French influence in Belgium. Belgian/French Louis XVI Style will sometimes originate in excessive and disharmonious over decorations; deeper investigation and research work related to its background, origin and interpretation is needed. Allow me a small excursion into French and Belgian history to give you a little background for silver production of the early 19th century. The French Revolution brought about the destruction of many 17th and 18th century works of art and silverware. 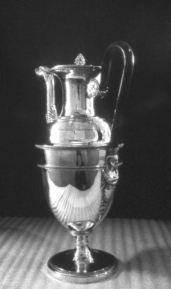 In France, the silverware of kings and the nobility was sent to the crucible to help to reestablish financial order. Much the same happened in Belgium. Church silver and tapestries adorned with silver and golden threads were destroyed. One example is St. Lambert Cathedral, Liège, which was totally demolished. The revolution of 1789 brought about major upheavals for the silversmiths, mainly due to the abolition of all guilds, (France in 1798; Belgian territory the following years). This was seen at the time as a social and humanitarian measure. It dissolved the strict relationship of dependency of apprentices and journeymen on their masters, but also destroyed the traditional structure of learning the craft. Another consequence was the development of competition, as well as the transformation of traditional work and opened the path to mass production and mechanization in order to satisfy the demands of the newly created and rich ‘middle-class’. ‘Amphora form’ and one of the typical model of foot for the Empire period in Belgium. Called ‘piedouche’ in French. The decoration, mostly in low relief, is harmoniously melded with the austerity and sobriety of the form. Its inspiration derives mostly from vegetable or floral form, allegorical animals or finds its characters in the mythological world. A high level of quality for the sculptures, chasing and engraving can be observed. There is also a profuse use of the Vermeil – a gilding method of silver using mercury. Vermeil is also often referred to as ‘Fire Gilding’. This technique was very popular in France, England and with less frequency in Germany. We can speak of a certain democratization of silverware here. Vermeil was the decoration ‘à la mode’ and highly appreciated by the new middle class who wanted to ‘copy’ the golden works of art, made as royal commissions of bygone eras, at a more reasonable price. The Battle of Jemappes in 1792 brought the French invasion and as a consequence the ruin of the country. Many Belgian religious orders, the clergy and nobility were abolished. The ‘Corporation system’, essentially the organization of the trades into guilds was also destroyed. From 1798 to 1814, my beloved fatherland was under French ‘Regime’ and as a consequence of the new French organization, was subdivided into 9 French ‘Départments’. The most important ones are the ‘Départment de la Dyle’ for the cities of Brussels and Louvain, the ‘Département de l’Escaut’ for Gent and Oudenaerde; the ‘Département des Deux Nèthes’ for Antwerp; the ‘Département de la Lys’, for Bruges and Ypres; the ‘Département de l’Ourthe’ for the city of Liège, and the ‘Département de Jemappes’ for the cities of Mons and Tournai. 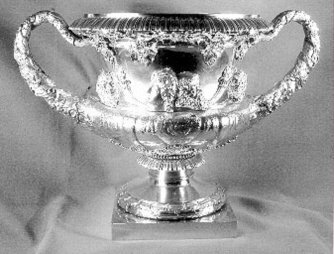 During the period from 1798 to 1814, the silverware from our Land reflects mostly the French influence with a spicy perfume of English and Dutch taste. There is one exception, however, the Empire style in France originated important objects of ‘prestige’ in ‘Vermeil’, and the Belgian silversmiths did not often use this kind of ‘gilding’. Reasons for this absence might be found in the way of life of our society - or the economical depression - Belgians were not attracted to this prestigious type of ornamentation. Characteristic for the silver production of that period is the elegant design with simplified 'Neo-classical' architectural forms, adorned by stylized floral rims and borders. Handle attachments, finials and spouts mostly represent mythological or Napoleonic symbolist animals (Figure 5) or use stylized empire vegetal decoration. ‘Sprays’ of lightly engraved vegetal motifs will give a very ‘charming’ accent to the otherwise sober, quite plain and simple forms. Grace, elegance, austerity, harmony - these are the qualities of the Belgian Empire Style interpretation. To name a few important masters: talented and imaginative crafts-men were Petrus Gabriel Germain Dutalis, Joseph Germain Dutalis (son of the former) and Josse Allard in Brussels; JB Verberckt in Antwerp, G. Drion in Liège, 'Veuve' (Widow) Roelandts and de Bapst Tiberghien in Gent. From 1814 to 1831, following the French annexation, the Dutch invasion brought a new authority of the Netherlands and its Protestant king: Willem Oranje-Nassau to Belgium. 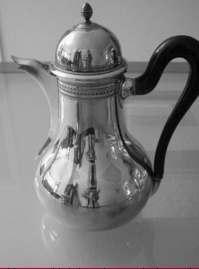 This period is very interesting and rich due to the economical development and as a consequence the artistic production -a long lasting Empire style silver- reflects the austerity of Dutch Protestantism mixed with a zest for English taste. 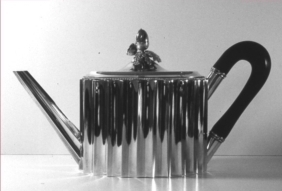 The gap of creativity due to the disappearance of the 'Corporations (Guilds), in France as in Belgium, made the influence of English silversmiths welcome. Protestant austerity of the Netherlands gave birth to rather severe objects and design schemes, which sometimes make us, think of an early Art Deco. 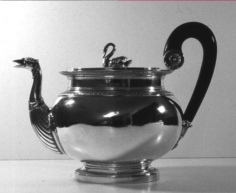 Typical decorations of Belgium silver at that period are: Neo-classical forms underlined by vertical fluted ornamentation, or totally plain clean forms with strong lines and 'deep' empire style borders. 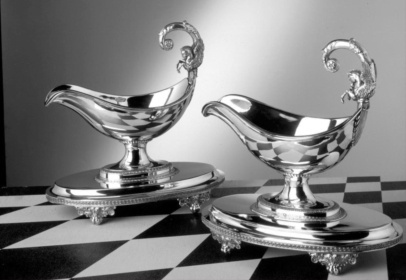 The economical prosperity now provokes a demand for high quality silver. William of Nassau, his court and the ‘High Society’ ordered important objects from important Belgian silversmiths such as Joseph German Dutalis who created wonderful works of arts in vermeil with a distinct Parisian influence. The quality of creations of this artist may be compared to those of a Jean Baptiste Claude Odiot - one of the most famous Parisian silversmiths of the Empire Period. The work of J.G.Dutalis are highly appreciated today – a ‘Psyche', standing mirror, made by Dutalis fetched the enormous price of € 254,000 when sold at an International public auction in 1994. At the beginning of the Belgian Realm (early 1830's), due to fashion or affinity we still enjoy a long lasting or long cherished Empire style. This period reflects less austerity though more flourish and richer expression, which probably is the real style interpretation of our wealthy middle class. At last we finally became independent and a real country of our own ! Dievoet’s book is the best modern study of Belgian marking system and features very accurate photos of the different marks. Belgian silverware bears the same marks as those of the French ‘Département’, but is stamped with the department numbers registered for our regions. I am confident that the above information and the sharpness of your educated eyes will help you to recognize the fine detail or the softness of the decoration and make you appreciate the subtle charm of Belgian Empire silverware. Called: ‘au 1er Coq’ = ‘First Rooster’. Assay mark - silver standard: ‘Rooster’ used for the first or second ‘alloy’ (with number 1 for: 950/1000, or 2 for 800/1000). The second assay with 2 - 800/1000 was used in Belgian territories at the same time. Guarantee mark - Hallmark: A ‘Facing head’ with the number of the department placed to the side. The department number will help you to know in what department or city the silversmith was working. Maker’s mark: two or three initials, or the full name, with or without a ‘symbol’ are displayed in an either vertical or horizontal lozenge form. Called ‘Au second coq' or 'Second Rooster'. 1- Assay mark - silver standard: The so-called Second Coq (four variations) with a double line. The second standard 800/000 is more frequent. Not many items of this period are extant. 2- Maker's mark: two or three initials, or the full name, with or without a ?symbol? again in either vertical or horizontal lozenge form. This system of marks is used in France till 1819, in Belgium only until 1814 due to the Dutch invasion. 3- Guarantee mark – Hallmark: A ‘helmeted warrior’, the number of the department is engraved inside the helmet, which is sometimes difficult to read. Assay mark - silver standard: In a rectangular form with cut corners: A Figure 1 above two Crossed Laurel branches, for 934/1000 silver. (Adaptation to the Dutch Regime) - Or In a Square form: A Figure 2 above two crossed laurel branches, for 833/1000 silver. Maker’s mark: Different possibilities. The same type of marks as in the two first French periods or the same type of maker’s mark used in the Netherlands, Letters and/or symbol in a square form. Consult: Poinçons d’argenterie belges – Stuyck- Standaard Uitgeverij. & Editions Erasme. Assay mark- silver standard: In a rectangular form with cut corners: A ‘LYRE’ a figure 1 and letter T (for 1er Titre = 950/1000 silver content). Or more commonly used, the ‘JANUS’ double head in a rectangular form, with figure 2 (for 800/1000 silver content). Maker’s mark: Different possibilities. Lots of various forms. Consult: Poinçons d’argenterie belges – Stuyck- Standaard Uitgeverij. & Editions Erasme. • 'Poinçons d’argent' - Editions Tardy.